The impactor believed to have wiped out the dinosaurs and other life forms on Earth some 65 million years ago has been traced back to a breakup event in the main asteroid belt. 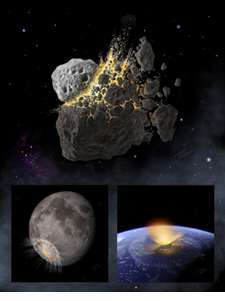 A joint U.S.-Czech team from Southwest Research Institute (SwRI) and Charles University in Prague suggests that the parent object of asteroid (298) Baptistina disrupted when it was hit by another large asteroid, creating numerous large fragments that would later create the Chicxulub crater on the Yucatan Peninsula as well as the prominent Tycho crater found on the Moon. The team of researchers, including Dr. William Bottke (SwRI), Dr. David Vokrouhlicky (Charles University, Prague) and Dr. David Nesvorny (SwRI), combined observations with several different numerical simulations to investigate the Baptistina disruption event and its aftermath. A particular focus of their work was how Baptistina fragments affected the Earth and Moon. At approximately 170 kilometers in diameter and having characteristics similar to carbonaceous chondrite meteorites, the Baptistina parent body resided in the innermost region of the asteroid belt when it was hit by another asteroid estimated to be 60 kilometers in diameter. This catastrophic impact produced what is now known as the Baptistina asteroid family, a cluster of asteroid fragments with similar orbits. According to the team's modeling work, this family originally included approximately 300 bodies larger than 10 kilometers and 140,000 bodies larger than 1 kilometer. Once created, the newly formed fragments’ orbits began to slowly evolve due to thermal forces produced when they absorbed sunlight and re-radiated the energy away as heat. According to Bottke, "By carefully modeling these effects and the distance traveled by different-sized fragments from the location of the original collision, we determined that the Baptistina breakup took place 160 million years ago, give or take 20 million years." The gradual spreading of the family caused many fragments to drift into a nearby "dynamical superhighway" where they could escape the main asteroid belt and be delivered to orbits that cross Earth’s path. The team's computations suggest that about 20 percent of the surviving multi-kilometer-sized fragments in the Baptistina family were lost in this fashion, with about 2 percent of those objects going on to strike the Earth, a pronounced increase in the number of large asteroids striking Earth. Support for these conclusions comes from the impact history of the Earth and Moon, both of which show evidence of a two-fold increase in the formation rate of large craters over the last 100 to 150 million years. As described by Nesvorny, "The Baptistina bombardment produced a prolonged surge in the impact flux that peaked roughly 100 million years ago. This matches up pretty well with what is known about the impact record." Bottke adds, "We are in the tail end of this shower now. Our simulations suggest that about 20 percent of the present-day, near-Earth asteroid population can be traced back to the Baptistina family." The team then investigated the origins of the 180 kilometer diameter Chicxulub crater, which has been strongly linked to the extinction of the dinosaurs 65 million years ago. Studies of sediment samples and a meteorite from this time period indicate that the Chicxulub impactor had a carbonaceous chondrite composition much like the well-known primitive meteorite Murchison. This composition is enough to rule out many potential impactors but not those from the Baptistina family. Using this information in their simulations, the team found a 90 percent probability that the object that formed the Chicxulub crater was a refugee from the Baptistina family. These simulations also showed there was a 70 percent probability that the lunar crater Tycho, an 85 kilometer crater that formed 108 million years ago, was also produced by a large Baptistina fragment. Tycho is notable for its large size, young age and its prominent rays that extend as far as 1,500 kilometers across the Moon. Vokrouhlicky says, "The probability is smaller than in the case of the Chicxulub crater because nothing is yet known about the nature of the Tycho impactor." This study demonstrates that the collisional and dynamical evolution the main asteroid belt may have significant implications for understanding the geological and biological history of Earth. As Bottke says, "It is likely that more breakup events in the asteroid belt are connected in some fashion to events on the Earth, Moon and other planets. The hunt is on!" The article, "An asteroid breakup 160 Myr ago as the probable source of the K/T impactor," was published in the Sept. 6 issue of Nature.